Most books flow out of me. I get an idea, start writing, and work on them from time to time until they have enough of a skeleton to develop into a novel. I guess my approach to writing is as random as they way I do everything else; I potter about here and there, and don't consciously work on them until it's time to finish up. Wrath of the Goddess was always different. 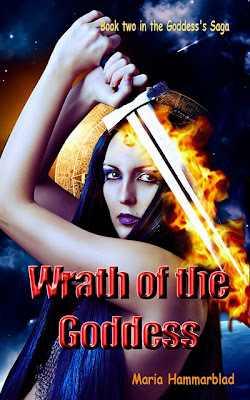 When I first got the idea for The Goddess's Saga, book one and three almost wrote themselves. The second book in the series, not so much. It fought me tooth and nail and did not want to be written. I had book three finished long before book two. Ever since Desert Breeze Publishing signed me up, my life has been a learning experience. I learn new things every time I'm in contact with one of their fantastic editors. I learn new things every time I just talk to the editor in chief. They're not at all involved in The Goddess's Saga - they're not into the pagan deity thing - but after working with professionals for a couple of years I saw my earlier, self-published books with new eyes. The Goddess books clearly weren't up to par. To be honest... The writing sucked. Ouch! I took them off sale and begun my rewrite with great enthusiasm. I had written them once. Touch of the Goddess had been edited by a professional company who charged a hair-raising sum to do it. How hard could it be to polish them up? The first book, Touch of the Goddess, didn't put up much of a fight. I poked around with the third book, Return of the Goddess, because it was always my favorite. I'm not worried about that one. It will be happy to be polished and re-published. Wrath on the other hand did not want to be re-written. If a story could defend itself with weapons, it would. It's happening anyway, of course, and I'm delighted to say the book is almost done. It just took three times longer than I expected. Maybe my Goddess doesn't like to be wrathful. Sarasota Book Fair - Success!